I’ve just returned from running a sketch & walk course in the Lake District with a lovely group of students, where the biggest problem was a lack of water! This is something which is rarely encountered in Lakeland, and it did confound attempts to sketch certain waterfalls rather devoid of water. Still we had a great time and at least we eventually found some in Coniston Coppermines Valley. 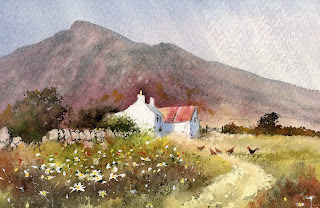 The watercolour on the right is the view we painted, though I actually did this three years ago during autumn when there was more water in the beck, and the hillsides were alive with warm colours. 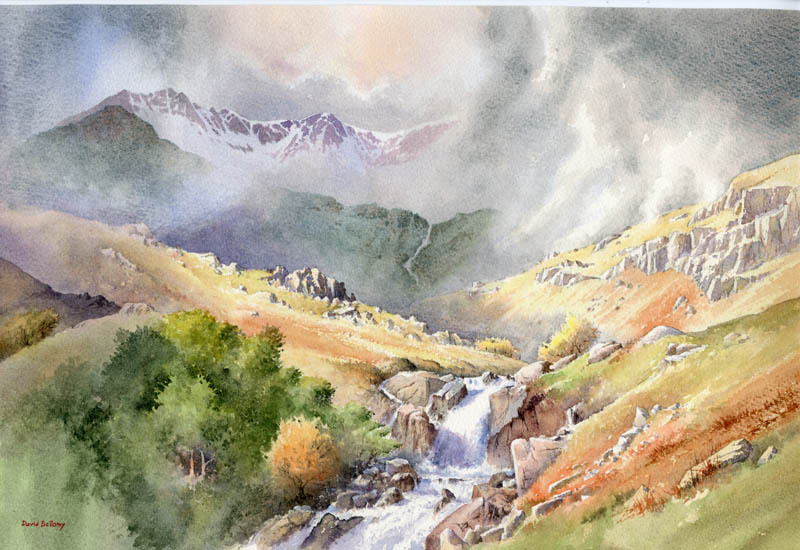 This also happens to be on the cover of the summer issue of Leisure Painter magazine, featured in an article on creating wisps of cloud and streamers, which can so enhance your work. It was painted on Saunders Waterford rough 140 lb paper, and to achieve the soft misty edges I scrubbed with a damp half-inch flat brush. Losing ridges and parts of a hill or mountain can add so much mood and mystery to a landscape, and the article covers various ways in which you can achieve these effects. 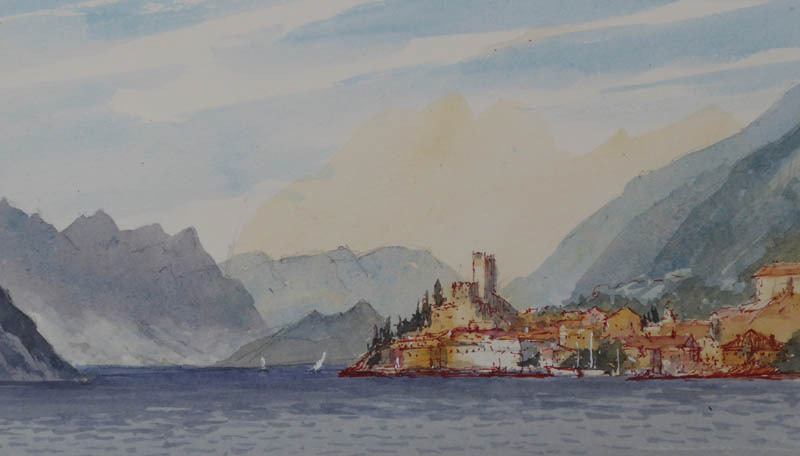 These softening-off techniques are a common feature in my books, especially the Winter Landscapes in Watercolour and Skies, Light & Atmosphere in Watercolour. Some artists feel that a standard broad-washed blue or grey sky can fit any landscapes, but I put great effort into my skies to introduce exciting and interesting cloud and atmospheric effects that suit a particular landscape, so there are a great many examples of these in both books. In Lakeland my biggest problem with the students was keeping up with the three octogenarian ladies, one of whom was leaping up and down precipitous slopes like an over-active monkey. What a great pleasure it is to see people respond so well to the beauties of nature. Are you making the most of the stunning colours in the countryside at the moment? It’s a great time for getting out to capture one of nature’s most flamboyant periods with your camera, sketchbook or maybe even a full alfresco painting. Watch especially for those vivid colours backlit with strong sunlight that will simply leap off your watercolour paper. Birch trees can be especially rewarding when lit up by strong light, as white trunks and warm colours work together extremely well. My watercolour of the River Wye in autumn on the left includes a great many trees (although this is not the entire painting), but the distant conifers have been left without detail to throw the emphasis onto the trees with autumn colouring. For these I have used new gamboge, cadmium yellow pale, cadmium red and some touches of cadmium orange, with French ultramarine with a touch of cadmium red for the far conifers. The painting was done several years ago, and since then my autumn palette has changed a little: I now use quinacridone gold, transparent red oxide, Aussie red gold and cadmium red in the Daniel Smith watercolour range, as these colours fairly sing out. In the painting note that the trees on the extreme edges of the painting have been kept fairly dull. This is to throw the emphasis onto the brighter trees and to avoid drawing the eye towards those edges. 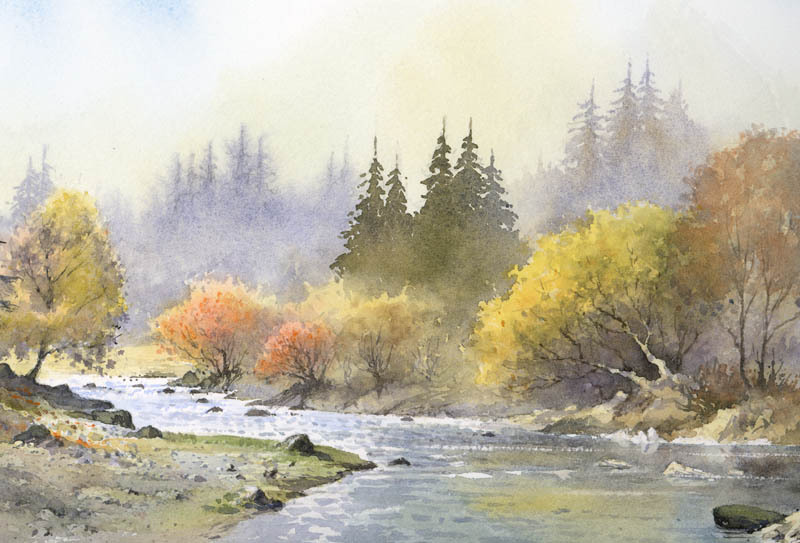 While the sun doesn’t always oblige us when we need it, don’t forget that autumn scenes can benefit from a little rain, wind and mist – elements most artists prefer to keep at a distance. Rain produces puddles which can be used to reflect these vibrant colours, and if followed by a sunny spell the result can be magical as the scene glistens and sparkles. Mist can throw the emphasis onto a small group of interesting trees and obscure the rest, and wind, that bane of all landscape artists, can send clouds of leaves hurtling through the air. To include a few of these suggests a lovely sense of a windy day. Make the most of these moments as they can add so much authenticity to your work. It’s been almost impossible to do much painting or writing lately, thanks to a very happy event. 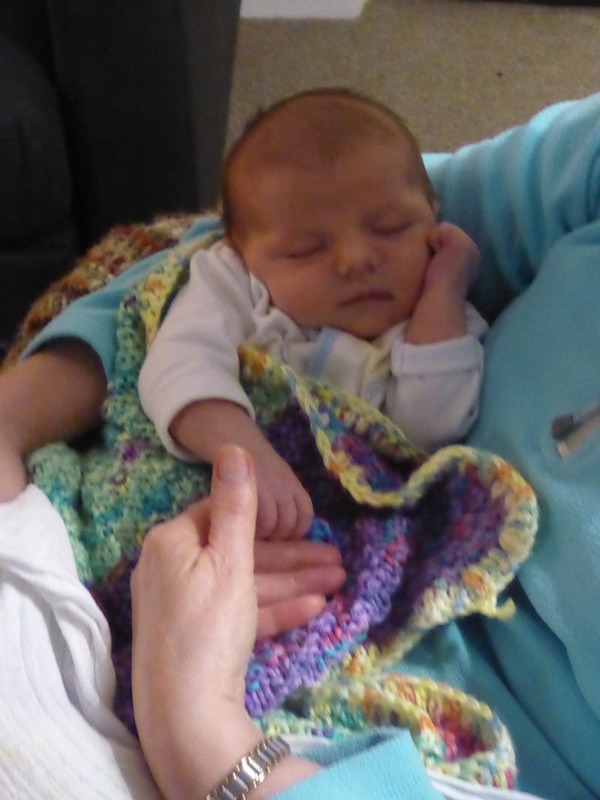 On 22nd February my daughter Catherine gave birth to an absolutely gorgeous little daughter, so for the first time I am now a grandad. She goes by the name of Guinevere, and I can’t wait to paint her. She’s already had a trek across the mountains at around 10,000 feet in the Italian Dolomites, when Catherine was carrying her last July, and as you can see from the photograph she is obviously deep in artistic contemplation. For my own contemplation I’m beginning to put together thoughts and images for my next book about coastal scenery, for which I have a whole host of new work from both the UK and abroad. My Arctic book will be coming out in June, so there will be more on that later on, but it’s important to keep thinking ahead when you work on various projects. The sea has always been one of my favourite subjects, and the coastal book will be the fourth and last in my current series of how-to-paint books. Before I go, just a quick tip on painting those boaty things – you don’t always have to insert a complicated harbour background into the composition, or indeed any sort of complex background. 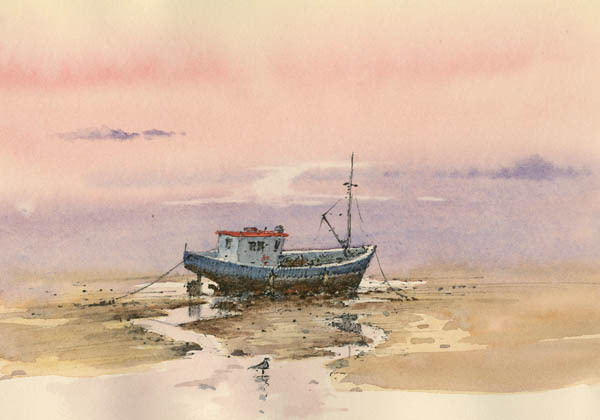 In this watercolour sketch I have simply brought the atmospheric sky down to meet the sand, and left it at that. Just because something is there, you don’t have to include it! And don’t forget – if you want to get views of a boat from all angles it pays to take along a pair of wellies before you dive into that lovely mud….